Students, workers, and faculty at the University of Toronto gathered yesterday to rally against the privatization of funding and decision-making at the university. The rally began outside of Simcoe Hall, where University’s Governing Council was meeting. Renowned intellectual and visiting speaker Noam Chomsky addressed the crowd about the need for free and accessible education. Campus and community members were angered by the agenda for this particular Governing Council meeting. Governors were set to ignore a motion served by a student governor calling for a renegotiation of the Munk Foundation’s contentious donation contract with UofT, and to increase tuition fees so that for the first time ever, tuition and user fees are projected to surpass public funding in UofT’s operating budget. University privatization means that the campus’ governing bodies are less accountable to the public, including students, workers and faculty – at the same time, governors are demanding that students pay more. 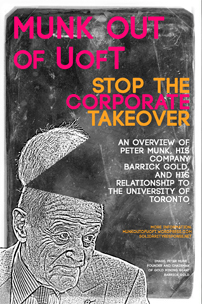 “We don’t want corporate or bureaucratic control over the terms of our teaching, research or learning, yet the strings attached to the Munk donation mean that the activities of the new School of Global Affairs have to effectively be approved by the board of the Munk Foundation,” says Gavin Smith, Professor Emeritus of Anthropology at the University of Toronto. Smith finds these strings particularly troubling because Peter Munk is the founder and chairman of Barrick Gold, a company accused of human rights and environmental abuses around the world. Barrick Gold is also currently pursuing SLAPP lawsuits against three authors who have written about these issues. 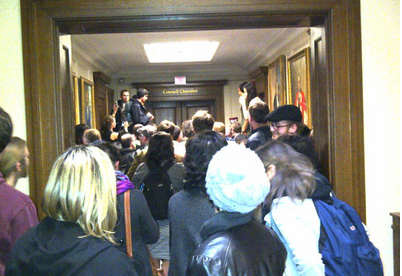 After the rally, a hundred students, workers, faculty and allies proceeded inside the building to observe the GC meeting. According to paragraph 18 of the University of Toronto Act (1971), these meetings are open to members of the public. However, six officers from campus police blocked the doors to Council Chambers, preventing students, workers, and faculty from entering the meeting. Among those denied access were elected student representatives who were scheduled to speak on proposed tuition fee increases. Security insisted that Council Chambers was full, although reports from inside indicated that the 120-capacity room contained no more than 80 people. Frustrated about being repeatedly excluded from decisions about their own school and livelihoods, those gathered outside of Council Chambers began to chant, clap, and stomp to assert their presence. Undergraduate student and participant Juan Carlos Jimenez found the experience to be empowering. “The energy [outside of Council Chambers] was incredible,” says Jimenez, adding that “for some of the people I met, this was their first time engaging in a protest. To see the Governing Council actively and physically alienate people who study and work here convinced a lot of us that something is seriously wrong, and that we need to work to change that.” Jimenez says that he is looking forward to future actions, and anticipates larger numbers and a greater impact.